There are a few things about the LISK case that I have come across that for different reasons I have tried not to discuss in open form. It seems though that now is the time to get to some of these things. Some are widely known at this point and some are not. I’m gonna start with one that is not. When John Bittrolff was first arrested, some one came to me with a shocking realization. They had seen Bittrolff in Oak Beach before. In fact Bittrolff had worked on a garage of someone who had been a part of the timeline of Shannan’s night in Oak Beach. I will get to the reasons I have not written about this till now, as well as why I have decided to put it out there. But first let’s just get it out there. In the early nineties, there was some sort of firework explosion in the garage of Gus Coletti, and John Bittrolff is the guy who was hired to fix it up. When I first heard this I was floored. If this was true, what a bizarre connection. I can tell you I have every reason to believe it’s true. The sources are reliable. So then all I could wonder was, is this just yet another strange coincidence that the LISK case is plagued with? Although I did discuss this with a few people and it did get mentioned in the comments of this blog, for the most part I did not disclose the name of whose garage was worked on, and here is why. First off, I had every reason to believe that LE would be looking into it. So I waited to see if it would come to anything. I did not want to harm the case by leaking something that could be twisted all over the internet before it had its chance to be investigated properly. In my opinion, all the stuff leaked and twisted early on is one of the main reasons the case is the mess it is today. When I started blogging about all this, most of the stuff I was discovering was old and already twisted. But this was different. And I had every reason to believe it would be twisted. Gus was a favorite target for Fluke. And Dorothy, yes she would love to fit this into her delusions of grandeur. Last thing I wanted was possible good information being tainted with the rest. Plus I didn’t know if it was important. Could the fact that a guy accused of killing at least 2 women, worked on the house where years later another possibly murdered woman had run to the night she diapered be a coincidence. I don’t know Long Island at all, but after everything I have learned about it, it seems everyone knows everyone else. And Bittrolff was a contractor. So maybe it wasn’t anything at all. So I was conflicted. When you say it out loud, “Bittrolff worked on Coletti’s garage”, it seems like a headline… a missing connection. But in the LISK case there are many connections like this (and I’m about to get to others as well in the next few posts) that seem to be big, but go nowhere. I myself believe Gus’ encounter with Shannan and Pak was as we have been told. Gus did not know them or what was going on when it all came to his doorstep. I also tend to believe, when the cops arrived that morning, everyone involved, meaning LE and the residents who had come out to greet them, thought Shannan had left, most likely with Pak. I may be wrong, but I don’t think anyone at that time had reason to think otherwise. Of course I could be wrong, but that’s how I’ve come to see it. I believe Gus wanted to help Shannan, but didn’t have any idea what was going on. So the last thing I wanted to do was throw red meat out there for people to feed on. Hopefully you all get it. If it was just a coincidence, I didn’t want to further mix this case up with coincidence. Plus with Gus having passed, I did not want to further hurt his family or allow the likes of Fluke and DPH to continue to try and tarnish his memory. If it wasn’t a coincidence and it somehow connected Bittrolff to Shannan or the GB4, I did not want to corrupt it with internet interference. Well first off, Bittrolff was found guilty for the murders of Rita Tangredi and Colleen McNamee. So this makes Bittrolff more than just one of the many suspicious characters being disused in the LISK case. Plus there are stories that Rita Tangredi’s daughter, Amanda Beinlich, was best friends with Melissa Barthelemy. More coincidence? As I said, this may be just a big coincidence. But here are the things that make me question it. Bittrolff wasn’t hired blindly, meaning he was introduced to Gus by a mutual friend. Someone who knew Gus and also knew Bittrolff. I don’t know much about this mutual friend, but I can’t help but wonder about him. How did he know Bittrolff? Now just because this guy may have been friends with Bittrolff doesn’t mean anything. If Bittrolff is a serial killer, and after his conviction I feel safe saying he is, then he was good at hiding his evil side. His friends and family had no idea from what I have read, and still don’t believe it. So again, this mutual friend may not mater much, but I’d still like to know how well they knew Bittrolff. Now this “mutual” friend introduced Bittrolff to Gus and the garage got fixed. But did Bittrolff meet anyone else while in Oak Beach? Did he continue any type of friendship with anyone there? Did he continue to visit there after working on Gus’ garage? These are questions I can’t help wondering about. And again, if Gus or anyone else in Oak Beach continued to hang out with Bittrolff, it doesn’t mean anything, No one seemed to suspect him of anything. But you can’t tell me it’s not important to know when was the last time Bittrolff was in Oak Beach. Speaking of which, from what I understand, the garage was worked on in the early nineties… we all know now what Bittrolff was up to back then. I will stress one more time, that none of this means Bittrolff is LISK. But it is possible that at least some of the bodies or body parts found off the beachs lead back to Bittrolff. We know some of them lead back to Manorville . So I hope someone is out there looking into John Bittrolff’s Oak Beach connections and visits. For those of you who actually read my blog before commenting (heh heh) you have probably seen me mention that I am Tower Junkie. For those of you that don’t know what that is… it means I am obsessed with the Dark Tower. While I may not have it as bad as Roland, it’s bad. I am Kai-mai but sometimes also Ka-mai. And on very rare occasions Ka-me. But I never forget the face of my father and I know all things serve the beam. I know Ka (or as Eddie calls it Ka-Ka) is a wheel; its one purpose is to turn. For those that have not read the Dark Tower books, I know you have no idea what I’m going on about… but that can change. My love for the Tower should come as no surprise, I have said I almost exclusively read Stephen King, and The Dark Tower is the center of King’s universe. I bring this all up again, because a few weeks back the Dark Tower movie came out. I of course saw it. My readers know I don’t like to give away spoilers (well at least not on books and movies and TV shows, you know what I mean), so I don’t want to get too much into the movie here in this post. I’m guessing since it didn’t get that great of reviews most of you haven’t seen it, and I don’t want to spoil it for anyone who may be waiting for it to hit red box or cable. I do want to say I feel most of the criticism is not quite fair. From what I’ve read most of those who didn’t like the movie didn’t understand what was going on and felt the characters and story line were not fleshed out enough. I can understand why some would feel that way, but the truth is quite the opposite. The true first story is very ambiguous and the few characters in it are not explained very much at all. The plot does not surface really tell the second and third book… but really doesn’t get going somewhere till the last 3 books. I believe the fear of not giving enough plot and character background led the movie makers to try to add as much as they could while still leaving room for an ongoing tale. This is where it fails. The movie tries to tell us too much. 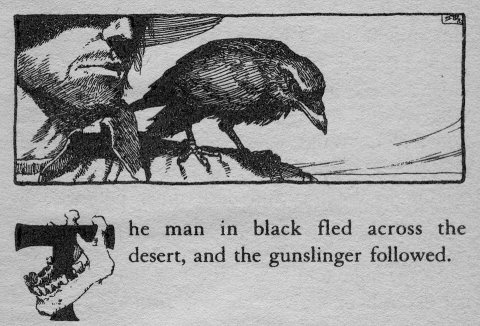 It wants to make us care more about why the Gunslinger chases the man in black, but accomplishes the opposite. There is actually stuff from the very last book in it, making the movie almost stand alone, skipping all that happens in between. More mistakes in my opinion. In trying to give more they actually created an illusion that they gave less. So trust me, those of you who saw the movie may have felt you weren’t getting enough of the story, but the real problem was you were getting way too much. I understand why they didn’t go straight for the sweet and simple western story of the first book. But at least when people said they didn’t understand the characters or their place in the story it would be because you aren’t supposed to yet, not because it was all jumbled up into one quick narrative. Plus The Battle Of Tull would have been so great to see on the big screen. All this being said, I still feel this movie was a good movie and you should all check it out. For one reason, I believe the plans for a HBO mini series is till planned, which will cover the 4th book in the series, “Wizard And Glass”. And that should be freaking awesome. If they do it right (and I know, we have no proof they will), it should spark the interest needed to make a really good movie or continue it as a cable series and everyone will get the chance to be a junkie like me. Still the best way is to read it. Yes, I’m a Tower Junkie, if any other Junkies or fellow travelers of the beam come across this post please feel free to comment, I’d love to know what you thought of the movie. And if any of my readers saw the movie, I’m dying for a discussion on it… but I’ve already said too much on it in this post. So just a warrning, Spoilers in the comments!